With one fuzzy image, history has been made. 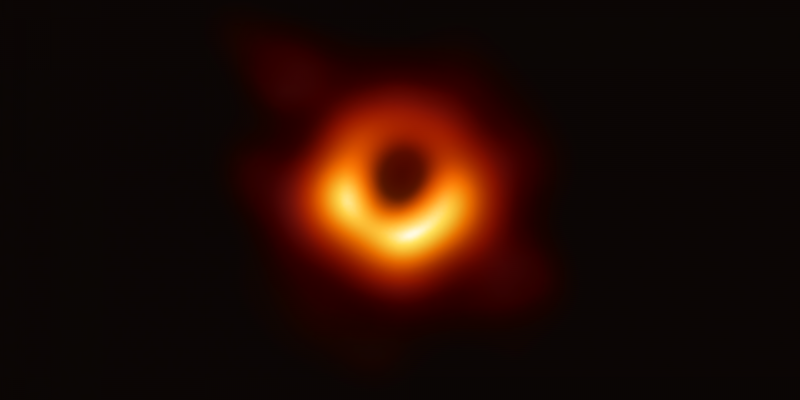 Note: At 6:30 pm (IST) on April 10, members of the Event Horizon Telescope (EHT) published the first direct image of a black hole, specifically the shadow of its event horizon. 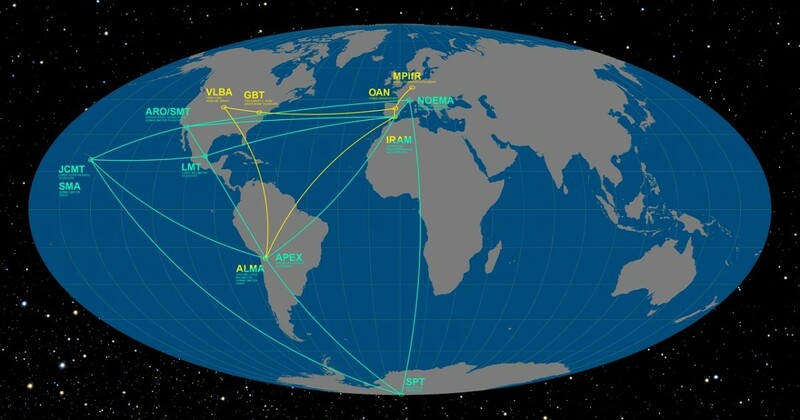 The EHT is a globally coordinated network of telescopes using which scientists achieved this feat. The black hole in question lies at the centre of a galaxy called M87, about 53 million lightyears away (towards the constellation Virgo in the night sky). The EHT collaboration is also observing the black hole at the centre of the Milky Way, located at a point astronomers call Sagittarius A*. The separate location and local context of the two black holes aside, the underlying principles concerning their observation are the same. They are delineated below, first published on April 9, 2019. While the black hole at Sagittarius A* is over 20 million km wide and weighs 3.5-4 million solar masses, it is also extremely far away: 26,000 lightyears. So astrophysicists who wanted to study it had a challenge: to find a way to view something the size of an idli on the Moon’s surface from Earth. They responded by developing the EHT. And the EHT solved their problem using a technique called VLBI, described below. On June 25, 2014, scientists announced the discovery of a trio of supermassive black holes at the centre of a galaxy 4.2 billion light years away. The find was credited to the European VLBI Network. A Space.com report said that this network “could see details 50-times finer than is possible with the Hubble Space Telescope”. How was this achieved? VLBI stands for very-long-baseline interferometry. It is a technique used in astronomy to obtain high resolution images of the sky using a network of telescopes across the planet that can – with the aid of high-tech computing – come close to mimicking the sharpness of a hypothetical telescope nearly as large as the planet. It is commonly used to image distant cosmic radio sources, such as quasars, although it is also sometimes used to study stars. The concept has its roots in Thomas Young’s famous double-slit experiment, which he conducted in 1801. When Young placed a screen with two extremely narrow slits in front of a light source, such as a burning candle, the shadow cast on the other side was not simply two bright patches. It was actually an alternating patchwork of bright and dull bands, as if the candle light had passed through multiple slits. This was the interference pattern. Young’s experiment was important to establish that light travels as a wave, overturning Newton’s conviction that light was composed of particles. When light passes through each slit, it diffracts, i.e. starts to spread out. At some point in front of the slits, the diffracted waves meet and interfere. Where crest of one wave met the crest of another, the combined wave had a higher crest than the two, and cast a bright spot on the screen. Where crest met trough, however, they cancelled each other. And where trough met trough, there was a dark band on the screen – a shadow. When the position of the slits was changed, the interference pattern also shifted. In VLBI, the candle is replaced by a distant source of radio waves, like a black hole. The slits are replaced by radio antennae on telescopes. Since Earth is rotating, the antennae are in motion relative to the black hole, and receive the radio waves at different times. When these signals are allowed to interfere with each other, they produce an interference pattern that is processed at a central location to recreate the state of the black hole, whether visually or any other way. Radio waves have greater wavelength than visible light. So radio telescopes have an inherently poorer angular resolution than optical telescopes of the same size. Angular resolution is defined as the ratio of an emission’s wavelength to the diameter of the telescope receiving it. Qualitatively, it denotes the smallest separation between two points that the telescope can distinguish in the image, and engineers like it to be as low as possible. For example, a 50-meter-wide radio telescope will have an angular resolution of 50/0.01 = ~41.2 arc-second. An optical telescope of the same size will have an angular resolution of 0.004 arc-second. In other words, the optical telescope will be able to view a feature 10,000-times smaller in its image than will a radio telescope of the same size. The question does arise: why don’t we simply view the black hole’s immediate surroundings in visible light then? This is because the astronomical objects that do emit radio waves encode certain information in them that visible radiation does not carry. Additionally, radio waves of wavelength 1.3 mm – that the EHT tracks – are not absorbed or scattered by dust in the Milky Way or in Earth’s atmosphere, allowing antennas on the surface to capture them. But this in turn requires a telescope’s dish antenna to be wider than Earth. 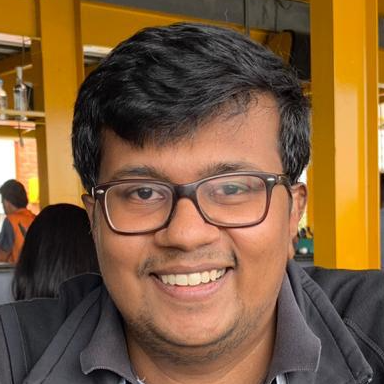 Fortunately, astrophysicists discovered in the late 1990s that the black hole’s prodigious gravity could be bending light ‘flowing’ near it towards itself, forming a gravitational lens that magnified it by five times. In turn, this meant a telescope required to ‘look’ at Sagittarius A* would need to have a diameter of a few thousand kilometres. Believe it or not, this was much more manageable. Enter VLBI. Because there are multiple telescopes receiving the radio signals, the angular resolution of a so-called interferometric telescope is defined in a different way. It is no longer the ratio between the wavelength and the diameter of the telescope. Instead, it is the ratio between the wavelength and the maximum physical separation between two telescopes in the array, called the baseline. If, say, the baseline is 1,000 km, the angular resolution of an array of radio telescopes becomes 0.002 arc-second – already 20,000-times better. However, this technique couldn’t be implemented properly until the atomic clock was invented in the 1950s. Before these advanced timekeepers existed, a single metronome had to be connected to multiple telescopes with cables, which limited the baseline to the amount of cable you had. With atomic clocks, telescopes could be placed on different continents because the clocks were kept in sync using international protocols. All together now: a telescope receives a radio signal, a computer sticks a timestamp on it and sends it to the receiver. The receiver collates such data from different telescopes and creates the characteristic interference pattern. Using this pattern, a processor recreates the source of all the radio waves at different locations, together with the time at which each signal was received. There are also many systems in between to stabilise and improve the quality of the signal, to coordinate observations between the telescopes, etc. But the basic principle is the same as in Young’s experiment two centuries ago. 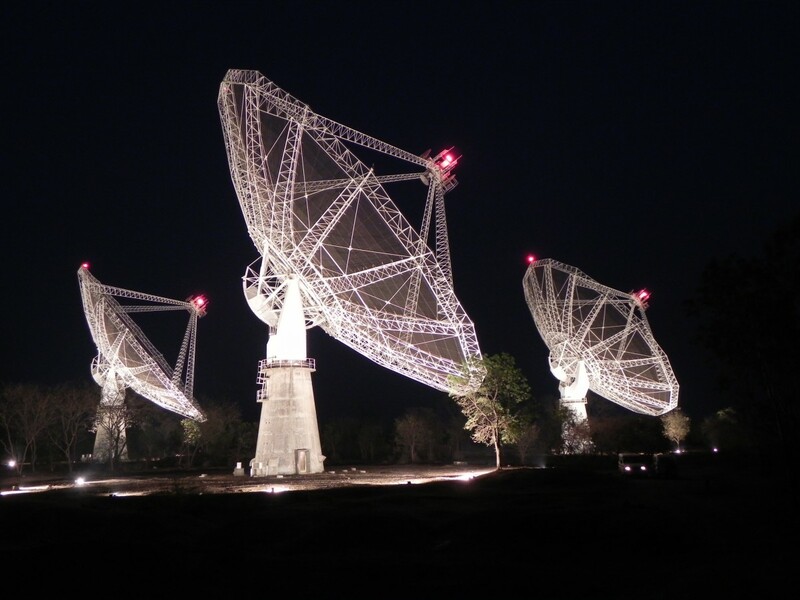 VLBI itself has been around since the 1960s. At first, it could detect radio waves with a wavelength of a few centimetres, and gradually moved to lower and lower wavelengths – or higher and higher frequencies. The EHT itself has over 30 participating telescopes spread over the North and South Americas, Europe, the Pacific Ocean and Antarctica. Because of their need to work together and their varied geographical locations, the EHT can study the Sagittarius A* site only when there are clear skies over all these telescopes at the same time. This is about one week per year – which makes each observation very precious. It is also notable that for all of its sophistication, the EHT is not capable of producing an image of the shadow of a black hole the way Christopher Nolan and Kip Thorne did for the movie Interstellar (2014). We are likely to see a few pixelated images tomorrow put together from radio data. However, and assuming that is indeed going to be the case, it will still be a landmark achievement and a significant moment in the history of humankind. Now, because the black hole bends light around itself, radiation from the accretion disk from behind the black hole will be visible to telescopes that are looking at its front. Finally, because the material in the accretion disk is swirling around – say, from left to right – an effect called gravitational redshift will cause light on the black hole’s left to appear brighter, and of higher frequency, than that on its right. 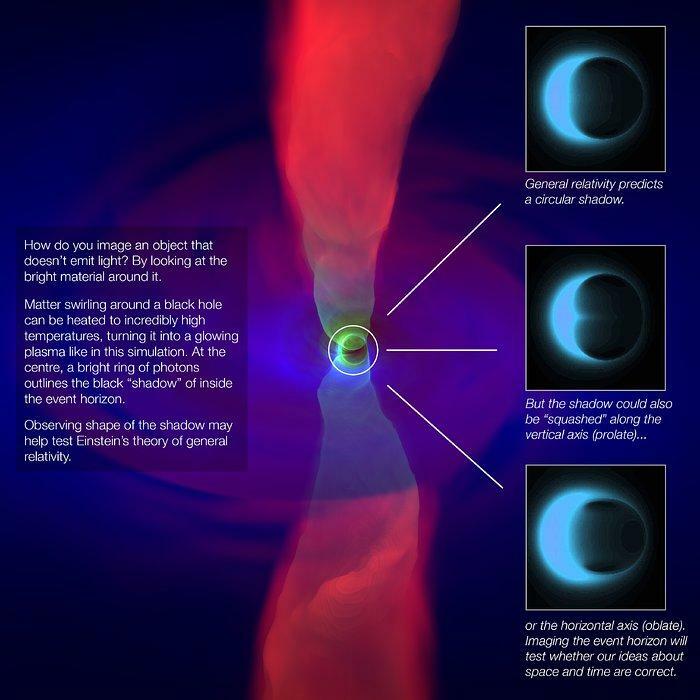 This will make the black hole at Sagittarius A* appear like in the infographic above. And the EHT uses VLBI to capture the black hole’s shadow against this light, this light created by the sacrifice of entire stars. With thanks to Prajval Shastri, an astrophysicist at the Indian Institute of Astrophysics, Bengaluru, for extended inputs on the article. Some portions of the text above were originally published as a post on the author’s blog in 2014.